Happy November 23rd! I wanted to get this posted this morning but life got in the way and I didn't get a chance. Better late than never! I am a Doctor Who fanatic and I couldn't wait for The Day of the Doctor! I had multiple different nail art designs in mind but wanted to do something to incorporate more than one person or season so I ended up coming up with the clothing worn by some of my favorites! More Doctor Who fun after the jump! First, a better pic of the mani. Rose Tyler on my thumb, Doctor #9 on my index, Doctor #10 on my middle finger, Doctor #11 on my ring finger and Amelia Pond on my pinkie. I have not watched any of the classic episodes of Doctor Who yet (I only started watching a little over a year ago) so I have only really seen these 3 Doctors. Tennant is my favorite Doctor but I really like all 3 and think they have all done a wonderful job. I wasn't too keen on Matt Smith when he first came (maybe partially because I was going through Tennant withdrawal) but he grew on me and I'm sad to see him go. But I am looking forward to seeing what Peter Capaldi brings to the role. Amy and Rose are my two favorite companions and I think they're the most well-known, at least for now, so I had to include them as well! 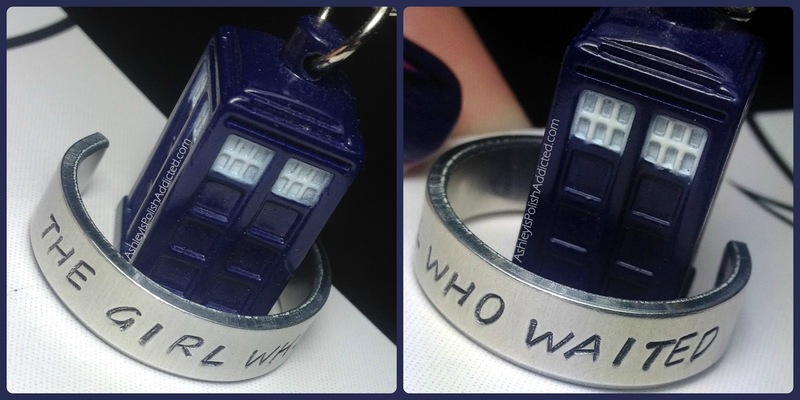 And a couple pieces of my Doctor Who jewelry that I wore today. First, my TARDIS "locket" which is magnetic and so much better than the old style lockets that made you break your nails getting them open! I really loved celebrating one of my favorite obsessions...errr shows... today. LOL I am going to see The Day of the Doctor on Monday in the theater and am planning another mani so I will show you that one as well! 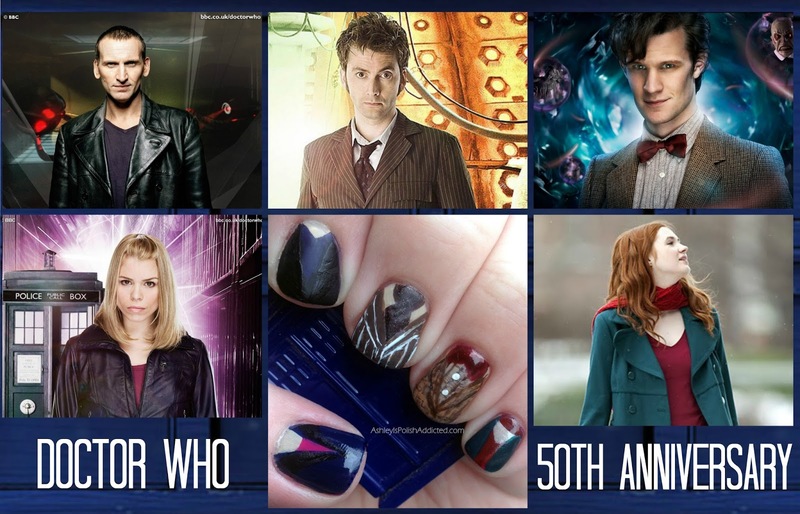 Check out the other celebration manis below! Your Ten is way better than mine! Thank you! ♥ And it is not! WOAH!!!!!! I LOVE LOVE LOVE THIS!!!!! And you payed respects to my favorite Doctor too..... awwwwwww I ♥ YOU!!! Pure perfection. 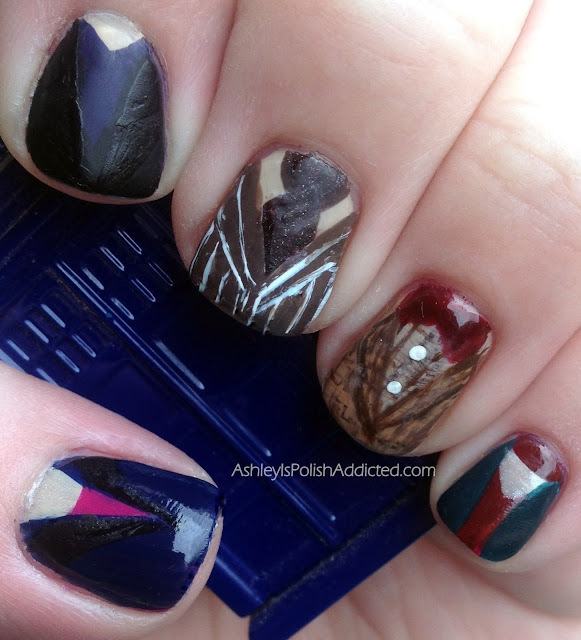 In my opinion this is the BEST Doctor Who mani i've seen!!! AMAZING AMAZING AMAZING!!! :) I literally just watched the episode and was blown away, love the inspiration you used for this manicure. I LOVE THIS SO MUCH! amazing job! 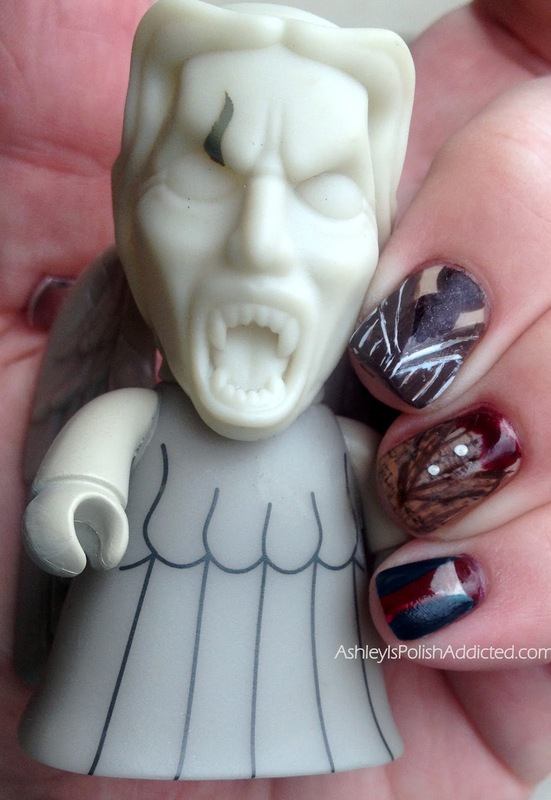 This is a totally unique DW mani and I love that all the characters are so easily recognizable before I even read the text! Great job and thanks for linking in with us! This is just FANTASTIC, Ashley. You did a wonderful job and I think doing the signature clothing is a strike of genius!!! haha this design is so great! brought a smile to my face on a monday morning, which is hard to do! I love that ring! I want one! This design is really cute and I love that you used two of the companions (Amy is my favorite). OH NOES! I looked at the angel! I love this! The concept is mega fab! Great mani! I love that you did their outfits! Fabulous job! And that angel is awesome!